Mazie Sommers, realtor and the original Matchmaking Mama, has a new client: four-year-old Ginny Scarborough, a determined four-year-old who is looking for a mommy for her daddy who has been sad too long. Ginny knows that Mazie is up to the task since Mazie is the one who found a mommy for the daddy of Ginny’s friend Greg (Once Upon a Matchmaker, 2010). Her daddy’s current girlfriend is a pretty lady, but Elizabeth is not mommy material. Ginny knows Elizabeth doesn’t even like kids. Ginny’s daddy needs a mommy, and so does Ginny. Mazie is charmed by her young client and accepts the challenge. In fact, she has just the woman in mind. Stone Scarborough, a former aerospace engineer turned general contractor, takes life seriously. Since his wife’s death eighteen months ago, he has focused all his attention on his daughter and on his job. The building industry has taken a big hit from the economic downturn, and Stone is exhausting his savings between jobs. So when Mazie Sommers sends a request via his sister that he contact her about a job, he’s not about to refuse even if his instincts tell him there’s something strange going on. Three years ago, Danielle Everette was just another cubicle occupant in a big insurance office in Atlanta, working to pay off her late father’s medical bills and her student loans. When the cooking and baking Danni did for friends slowly turned into full-time catering, she was surprised, but not nearly as surprised as she was when she received an offer to star in her own cable cooking show, Danni’s Desserts to Die For. The offer requires her to move across the country. Looking for a place to live that is a bit closer to the Southern suburban home she left behind than Burbank, she buys a house in Bedford. Her realtor? One Mazie Sommers, who has become a good friend. Now that Danni’s contract has been renewed and all those bothersome bills paid, she has the money for the renovations she’s dreamed of making in her 1970s house. Nothing is more natural than accepting Mazie’s recommendation for a contractor to do the work. Mazie recommends Stone Scarborough. The extroverted Danni with a smile as bright as California sunshine and a personality that wins friends and delights people is the opposite of the stoic, suspicious Stone whose reserve makes his name particularly appropriate. But these opposites prove the rule of attraction. Soon Danni is making home-cooked meals for Stone, and Stone is giving up free time to help Danni select things for her house. Ginny and Danni are bonding over cooking lessons and girl stuff. The future looks rosy, but Stone, who was devastated by his wife’s death, is wary of risking his heart again. Also, he finds it difficult to believe that a celebrity chef with an income many times that of a struggling contractor could really be interested in building a life with him. Danni’s too proud to question Stone’s decision. It takes a little child, who proves the best matchmaker of all, to help them find their HEA. I’ve been reading books by Marie Ferrarella since the 1980s. Hers was a name I learned to associate many years ago with heartwarming stories peopled with characters I liked and the family contexts I appreciated. All these years later, these are the same qualities I still appreciate in Ferrarella’s books. Wish Upon a Matchmaker is a quick, sweet read with appealing characters. It was fun seeing Mazie in action again, and I enjoyed watch Stone and Danni’s relationship develop. I know some readers find precocious children in romance lack credibility, but I’ve known enough kids to believe they come in all flavors. I thought Ginny was a darling. I also thought the relationship between Stone and his sister and between Danni and her co-workers added dimensions to the story. 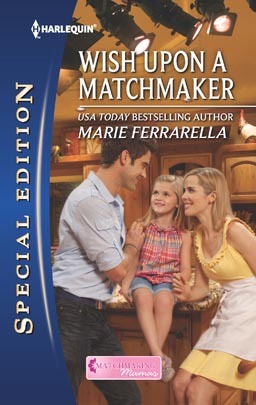 This is the ninth Matchmaking Mamas book, one indication that Ferrarella knows how to please her readers. This pleased reader recommends you give her a try. I like her books. I like most of these HQ Special Edition books. They are a quick read for me. What a sweet sounding book. Marie Ferrarella is a wonderful author whose novels make the reader happy. I had to smile at the aerospace engineer hero because I’m married to one myself. Looking forward to reading this new novel. I like her books.. They are always so heart warming and she has kids in them which endear me more to her books... And I love "Matchmaker" books.. It's great to see that Ferrarella has other fans here. I hope you all enjoy the new Matchmakers book. I've known some 8 year olds that are more like 30 year olds!! Scary!! Love her books! Thanks for the review!